POCUS Evidence Atlas - Biliary, Gallbladder, Cholecystitis. EBM review and resource of POCUS for biliary diagnosis. Sensitivity Specificity positive and negative likelihood ratios. Point of care ultrasound evidence. This was a systematic review including 4 prospective studies evaluating the operating characteristics of bedside ultrasound for acute cholecystitis (AC) in adult patients seen in the emergency department with a clinical suspicion for AC or right upper quadrant pain. Sample size of the studies varied from 30 to 193 subjects. Reference standard was surgical pathology. The experience of the sonographers varied between the studies and in one study no documentation of sonographer experience was noted. There was significant heterogeneity across the included studies precluding the authors ability to pool the results hence a range is noted in the operating characteristics table. 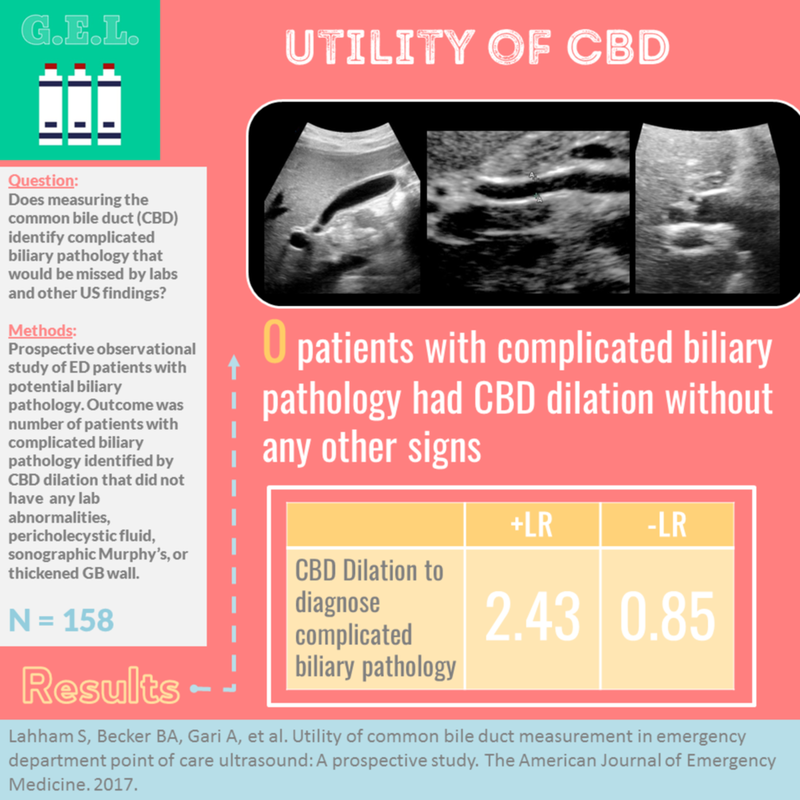 This was a meta-analysis including 8 studies (n=710) evaluating the operating characteristics of emergency ultrasound (EUS) for identifying cholelithiasis in adult patients presenting to the emergency department with symptoms suggestive of biliary colic (RUQ pain, epigastric pain, or right flank pain). Reference standards included radiology performed ultrasound, CT, MRI, and/or surgical pathology. There was quite a variation in the technical ability between operators which may distort the pooled sensitivity and specificity.